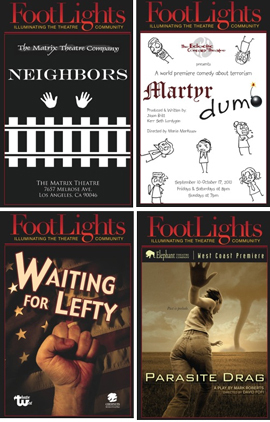 Starting this month, TheatreInLA.com is pleased to announce a collaboration with Footlights Publishing, Inc., publisher of Footlights programs for over 180 theatres in the Los Angeles area. The goal of the partnership is to provide greater coverage and easier access for L.A.-area residents and theatre-goers to Los Angeles' large array of live offerings. The mission of Footlights Publishing, Inc. is to "illuminate the theatre community and expand audience interest and participation in Los Angeles' ever-expanding, diverse, and creative theatres." To that end, they are teaming up with TheatreInLA.com to better serve the greater Los Angeles theatrical community by giving their readers convenient access to TheatreInLA's database of play openings, reviews, show spotlights, half-price tickets, and all the other features that users of TheatreInLA.com already enjoy. The result will be, according to Footlights publisher Peter Finlayson, "Los Angeles' most inclusive theatre listings site, a virtual online concierge for theatre-lovers." Besides accesses the TheatreInLA.com site directly, Footlights readers can also go to their website, www.gofootlights.com, and click on the "Around Town" link on the homepage. TheatreInLA's homepage will then appear, and visitors will be able to navigate around TheatreInLA's features without leaving the Footlights main site. Mark Meyer, founder and editor of the "TheatreInLA" website hopes that this collaboration will not only increase awareness of TheatreInLA.com, but help the same to Footlights as well and, by extension, the hard-working creative artists that make up the Los Angeles theatre scene. "The strength of the TheatreInLA site is the comprehensive, easy-to-navigate show listings and the strength of the Footlights Publishing is their great programs and feature content," says Meyer. "Working together we feel we can help the theatre community and showcase the great theatre in the Los Angeles area." TheatreInLA.com continues to be the one-stop, go-to source for everything that is happening onstage throughout the greater Los Angeles area. Please check back often for updates and new features in the coming months. And feel free to explore TheatreInLA's sister sites, TheatreInChicago.com and TheatreInDC.com.